Snow twice forced the closure of the Golden State (5) Freeway in the Grapevine area north of Los Angeles on Thursday. Snow first arrived early in the morning as a cold storm system that prompted a coastal flood advisory moved into Southern California. California Highway Patrol officers were pacing traffic along the 5 Freeway through the Fort Tejon area early Thursday before setting up a full closure. The 5 Freeway was closed from four miles north of State Route 126 at Lake Hughes Road to the Kern County line, but reopened at about 9:30 a.m. It was closed again at about 4 p.m., with the southbound lanes closed at Grapevine Road, north of Lebec. The northbound lanes were closed at Parker Road in Castaic, according to CHP. A storm is expected to bring more snow to mountain areas and rain in other areas, and the High Desert was already pounded by snow and wind Thursday. 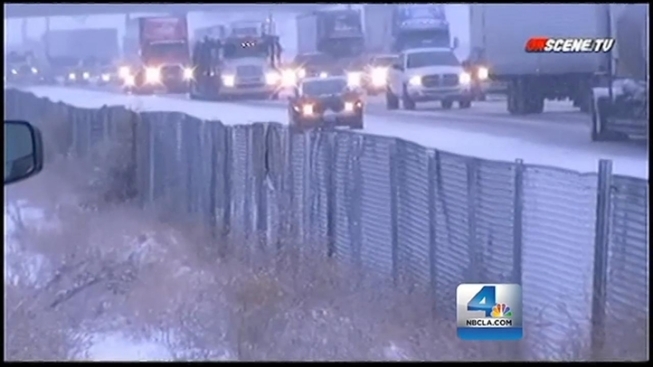 The 15 Freeway over the Cajon Pass saw multiple snow-related collisions. A coastal flood advisory was issued for counties between San Luis Obispo and San Diego. The advisory went into effect at 5 a.m. It will remain in effect until 11 a.m. Saturday. Temperatures are expected to drop by at least 15 degrees after Wednesday's warm-up in some areas. "It is going to be chilly with temperatures tumbling into the upper 20s and low 30s in some of the valleys," said NBC4 forecaster Elita Loresca. "Most of the rain showers have been light, but we're starting to see some moisture coming in from the north and west." Showers drenched the San Fernando Valley at about 7 a.m. Significant rain and snow amounts are possible Thursday afternoon and evening.